lazyeye had the most liked content! Beautiful scenery. The VFR looks good in black. This week I replaced the front tire and cleaned the hell out of the front brakes. The brakes were awful, something to do with riding in the rain all winter, and they were sticking pretty bad. The front tire was completely thrashed because of an unexpected track day (Pilot Road 4 is NOT a track tire) and because I'm pretty rough with the front end. Anywho I went out and rode it today and was amazed at how much a handling difference a new tire and functioning brakes make. For a 550lbs bike the VFR can be pretty nimble when you put your mind to it. Greetings my Californian brethren. I'm kicking around the idea of riding down to Sonoma for the August MotoAmerica round. I don't really want to get raped on motel prices there like I am at Laguna Seca so I was thinking of camping at the raceway. For people that have done it; what's it like? Is it all RVs or does anyone moto-camp it? Thanks. I have that setup and have no issues. So all those unhappy with BeIn can drop them and stream the MA series of the internet. https://motoamerica.com/2019/02/motoamerica-announces-live-streaming-for-2019/ On a tangent I was looking to book hotel rooms for Laguna Seca this year and then stopped when I realized it was going to cost over $200/night for Motel freakin 6. Salinas is hella cash grabbing, and then the taxes on each night was $40+! OK rant over. Giving up on Honda / Honda Giving up on us? 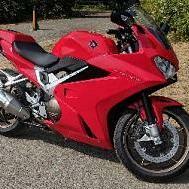 I like the 8th gen VFR but there are some annoying things about it. If big H came out with an update to the 800 with more power, cruise control, and no-vtec I'd probably look hard at getting it. Its kinda like all of us waiting for them to release a real update to the Fireblade, which will probably never happen. They aren't in the business of catering to cult status bike enthusiasts. Its not like they've come to me and said, "Hey LazyEye, give us a rundown of everything you want out of a SuperBike and a SportsTourer". 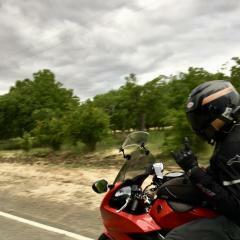 Yesterday I was enjoying some spirited riding out with other sport bike enthusiasts. Everything was going great until I started feeling my whole bike wobbling fiercely. I slowed and the wobble continued, and got worse, so I stopped with the other guys. Turns out I had only two lug nuts holding my rear wheel on, and those were loose. We were in the middle of nowhere, but I convinced one of my friends to ride to the nearest town and check NAPA for the appropriate part, an hour later I had new lug nuts installed. The last idiot who installed the rear wheel was me, so I have nobody else to blame. I did it with a torque wrench, and in the star pattern. I'm not sure what I did wrong, but lesson learned. Check your nuts. That's impressive. Keep up the good work. I was going through my pictures of classic superbikes and started wondering... What went into prepping a bike for racing back in the day? Now-a-days everything has to be safety wired, you have to have belly pans, all sorts of stuff. Back in the 70s-80s-90s what was it like? Attached two of the pics I've taken that got me wondering. That's a neat read. Thanks for posting. Too bad they don't make one for the '14+.